Some patients may have very limited range of motion in a joint or limb on land, however when in water we often see more movement and are therefore able to strengthen and stabilize more easily. Sit to stand and walking on land may use up all your energy after one or two repetitions. When in water, buoyancy effects mean you effectively weigh less so may be able to work harder, get more repetitions and ultimately improve your strength, endurance, function and balance. early fitness and early function such as rolling over and sitting balance. Often upper limb rehabilitation is considered secondary to the functional rehabilitation required for walking. Whether it be pain management for a painful shoulder post CVA or promoting and facilitation of upper-limb activity in traumatic brain injury, the water and its properties lend themselves to upper limb rehabilitation. 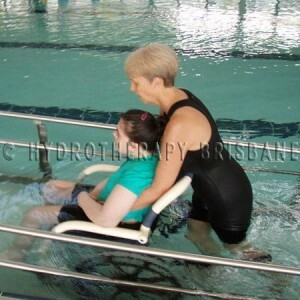 There are many types of conditions that can be treated with aquatic physiotherapy. Please feel free to contact us to discuss whether hydrotherapy might be beneficial for you or someone you care for.